I CAN'T EVEN COMPREHEND MY THOUGHTS. I DEFINITELY CANNOT WRITE A LONG REVIEW RIGHT NOW, BECAUSE I CANNOT EVEN EXPRESS HOW MUCH I LOVED THIS BOOK. I AM IN LOVE WITH KHALID. I WANT HIM AND SHAZI TO BE TOGETHER FOREVER AND LIVE HAPPILY EVER AFTER. EVERYONE NEEDS TO STOP WHAT THEY ARE DOING AND READ THIS BOOK RIGHT NOW. JOIN ME IN THE FANGIRLING. THIS BOOK WAS AMAZING AND I NEED THE SECOND BOOK. I NEED IT RIGHT NOW! Whoa, what a great spin to be given to 1001 Nights! I was in awe of the descriptions presented in this book. The world building and the writing were flawless. It made me feel like I was watching the story unfold just in front of my eyes. If you have read 1001 Nights you know that Shahrazad keeps herself alive by entertaining the king with amazing stories every night. This is pretty much what the heroine in this book does. Khalid is the Caliph of Khorasan. He is only eighteen but he has been married more than 70 times. 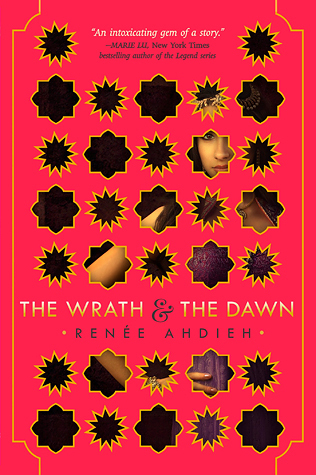 Khalid marries a new young woman every day to have them killed before sunrise. Shahrzad’s best friend Shiva was one of the women who perished under Khalid’s hands. Shahrzad volunteers herself to be the next wife. She only has revenge on her mind. Shahrzad is determined to make him pay for all the horror he has brought to the city and for all the lives of all the women who have died by his command. However, not everything is the way it seems. Khalid is hiding a secret and Shahrzad is determined to learn it. In the meantime, she has to remain alive. She not only has to fear the dawn but also the multiple attempts on her life from unseen enemies. 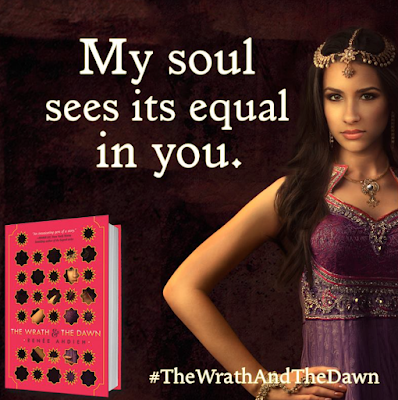 The Wrath and the Dawn made me fall in love with these characters. Shahrzad was a strong, determined and very bright young woman. She tried to learn as much as she could in very little time of how to manage Caliph. Khalid had a lot of blood on his hands. Despite him having his reasons for what he was doing, I still wasn’t pleased with the why. Don’t get me wrong I still fell for him. He was doing what he thought was best. As for the secondary characters, Jalal and Despina were both a perfect addition. I wish I could get more on their backstory. In regards to Tariq, he loved Shahrzad and he was trying to fight for her. There was nothing wrong in that except Khalid had already taken my heart. I hope he finds peace too.